Wisdom Teeth Extractions - Third molars are often impacted. Wisdom teeth are the third and final set of molars. They generally erupt from the gums in young adults between the ages of 17 and 25, at a time that has been called the “Age of Wisdom.” When a tooth fails to grow into the mouth, it is called an “impacted” tooth. In general, impacted teeth don’t have sufficient room to grow, which is very common. Ninety percent of people have at least one impacted tooth. Crowding or damaging adjacent teeth or roots, making them more prone to future decay and periodontal disease. Difficulty with cleaning, which can accelerate decay. Bone loss, loosened teeth and eventually tooth loss. Pain, and possibly infection, if the tooth is left in the gums too long. Gum and periodontal disease can be problematic, especially in expectant mothers, where it can increase the likelihood of preterm and low birth weight babies. In some cases, the sac surrounding the tooth may develop into a cyst. Cysts are often a sign of infection, and as they grow, they can cause damage to the adjacent teeth, bone, and nerves. The bacteria that live around wisdom teeth can contribute to health problems including diabetes, heart disease and kidney disease. 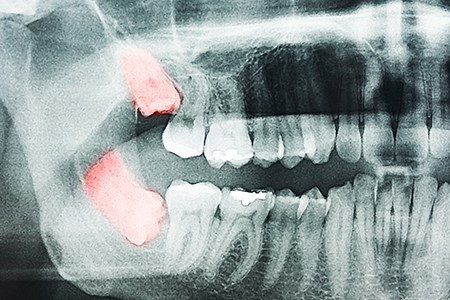 Should wisdom teeth be removed if they don’t appear to be causing any problems? Even third molars that grow in normally are prone to disease and can affect the health of the adjacent teeth. Therefore it is important to have your dentist or oral surgeon examine them annually, and evaluate whether they are causing any problems that cannot be seen. Most commonly, bacteria that causes periodontal or gum disease can grow around third molars and cause damage before any symptoms develop. Patients should not hesitate to have their wisdom teeth removed if any bacteria is found. Removing third molars is a relatively simple procedure, especially if the tooth is still healthy. A young adult’s wisdom teeth generally have shallow roots, making removal relatively easy. As the wisdom tooth grows, their roots lengthen and grow closer to the sensory nerves. In addition, as we age the bone surrounding the wisdom tooth becomes denser. Therefore, it is usually easier to have wisdom tooth removed when you're still young. What is the process for wisdom tooth extractions? Prior to your procedure we will meet with you and let you know what to expect based on the position of your wisdom teeth, and the condition of the root. This is the perfect time to ask questions and discuss any concerns. Most third molar extractions are routinely performed with little or no discomfort in our office with IV sedation, general anesthesia, or local anesthesia. Immediately after your surgery you will recover in our office for a short time. Your surgeon or an assistant will monitor you and provide you with post-operative instructions. Pain medication will be prescribed to use as needed during the first few days after your procedure. Patients are generally able to resume normal activities after a short period of time. Although it is important to watch the area of extraction for several weeks, and keep it clean during the healing process, most patients will not need any follow up care.